When set against the twisted landscape and cruel foes of the plane of eternal night, how will your character strike back against her foes? With nearly 300 options, you will surprise your enemies and your Game Master alike! Combat the undead hordes, vampiric flora and cruel, uncaring gods of Shadow with new favored class options, and make your character a hero of legends. This 12-page PDF delivers 26 different favored class options for 11 different races. With so many possibilities, the perfect one for your character awaits within. This includes a full color release and a printer-friendly version. What Stories Will They Tell of Your Character. In reading through all the various options that this 12 page gem has to offer, one of the first questions that comes to mind is 'Would I use this in a home game?'. The answer is a resounding yes. Each of the core races/classes, plus many of the popular 3rd party races/classes are covered and provide options for your characters and/or players to spice up the usual leveling experience. 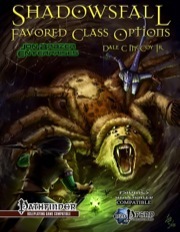 Favored Class Options utilizes the rules from the core Pathfinder books (Advanced Player Guide and Advanced Race Guide) to give players options outside of either gaining a skill point or hit point each level. Not yet playing through a home game with these options, I can not attest to their game balance. That said just reading through the various options makes me excited thinking about their use in-game (for instance, adding more time to the duration of an alchemist's mutagens or giving a Psion just a bit of help on saving throws). All in all, for the price it's worth checking out to give your home game some spice and make it just that much more memorable. More love for the odd races. For a 12 page supplement, there's a lot of information crammed in here. I like the layout & the artwork is high-end. Also nice is that it supports the less supported races. I'm not really all that familiar w/ the 3rd party classes, so I can't really judge the utility of those favored class options. However, for Core classes the favored class options provide an interesting mix of possibilities. All in all, I'd rate it as a good product. This pdf is 12 pages long, 1 page front cover, 1 page editorial/ToC, 1 page SRD and 1 page back cover, leaving 8 pages of content, so let's check this out! It's been some time since Jon Brazer Enterprises released the excellent bestiary for the upcoming Shadowsfall-subsetting, which details the Shadow Plane. This now is the very first supplement to provide new information for Shadowsfall in the guise of favored class options. As a reviewer, I hate those. Seriously. A lot of tightly crammed information, a lot of potential for balance-concerns to slip by and not too exciting to read. Super Genius Games' critically acclaimed and much lauded Time Thief and Time Warden are covered alongside TPK Games' no less celebrated Malefactor-class. If you haven't checked any of these out, do yourself a favor and do so now: They are plain awesome. Even better, fans of psionics are also covered by this pdf: Psions, Psychic Warriors, Wilders and Soulknives, i.e. all the base-classes from Dreamscarred Press' semi-official excellent Psionics Unleashed also get favored class options. Suffice to say that Gunslinger, Magus and all APG-classes also are part of the deal. The variant classes Samurai and Ninja are absent, though, but seeing that each of the races covers ALL of the classes with favored class options, I figure that's ok. Among the favored class options, we get the usual range of e.g. + 1/4 damage to unarmed strikes for monks, but also some creative deviations from what one would expect: Multiple races can for example add +10 minutes to the duration of alchemist's mutagens, a dodge-bonus for Malefactors when performing harrowing strikes etc., +1/6 of a d4 when using motes of time to boost a damage roll etc.. Drow soulknives may, by choosing 5 times the benefit, increase a soulknives' range by 5 foot (4 foot, 3 foot etc. is treated as no increase). Duergar bards also get a rather interesting one: Reduce arcane spell failure by 1% - seems boring, but as soon as you reach 10%, though, you also gain medium armor proficiency, awarding sticking to one favored class option over ten levels with a feat - nice idea. Duergar Oracles can gain Martial or Exotic Weapon Proficiency this way, each level reducing the penalty by one. I quite a fan of this approach to favored classes, since it simulates continuous training by the characters. Fetchlings cavaliers may impart a growing darkvision to their mounts. Editing and formatting are good, though not perfect: I noticed a minor glitch here and there as well as some wordings in need of clarification. Layout adheres to a full-color, used parchment look in 2-columns, is easy to read and comes with nice full-color artworks. The cover artwork is brilliant, but you see that yourself. The pdf also comes with a printer-friendly version that retains the full-color artworks, but omits the parchment-like background - nice. Both versions of the pdf come with extensive nested bookmarks. The first being that the favored class options feel more distinctly tied to the respective races - Drow barbarians e.g. improving the guarded stance rage power etc. The tying of these benefits to general fluff of the races is nice, though I would have liked the synergy to go further, perhaps tying in more with racial abilities. The second would be the synergy with the great 3pp-classes herein: Not only is the psionics-love awesome, the inclusion of the Time-classes and the Malefactor is the latest in a cool trend of 3pp-synergy pioneered by Rite Publishing's ties with SGG, Raging Swan and Adventureaweek.com contributing to Pathways etc. Whether it's LPJr Design's Section Omega, Ron Lundeen of Run Amok Games penning Dark Waters rising for Raging Swan Press or TPK Games supporting SGG's Death Knight - this synergy helps not only fellow publishers gain additional exposure, it also leads to an increased longevity and viability of the classes put out - especially when the new content for the classes is mostly as well-crafted as herein. All in all, I've mentioned that I'm probably not the best guy to review a pdf of favored class options. That being said, we get extensive hyperlinks to d20pfsrd (though I e.g. noticed an instance of "eidolon" not being hyperlinked, when in the subsequent sentence it was), which is awesome. However, on a personal preference, I would have loved the links to be indicated in some way, perhaps by underlining them - I've clicked on some of the hyperlinked words by accident and got the "connection to web"-prompt. This, combines with the minor balance-concerns I have as well as the nature of these favored class options mean that I can't go as high as I would have liked to with regards to my rating. If you're into the idea of favored class options, this book may very well be what you're looking for and it is actually a large step into the direction I'd love to see favored class options take in the future. For now, though, I'll remain with a final verdict of 3.5 stars, rounded down to 3 for the purpose of this platform. With the Shadowsfall: Shadow Plane Player's Companion, be sure to check out these favored class options. And reviewed here, on DTRPG and sent to GMS magazine. Cheers! I appreciate you taking the time to review. While I do appreciate the review, I do feel a number of criticisms within are a bit unfair. Hobgoblin Inquisitors may e.g. gain a bonus of +1 to concentration checks to cast Inquisitor spells each time they select the ability ...I think this ability needs to cap somewhere or be + 1/2. Another problem I found was that races like orcs and duergar can now choose for their barbarian to gain an additional round of rage per level - that's 1/6 of a VERY useful feat that become immediately available without the usual waiting over class-levels. All of these particular criticism are about items straight out of the Advanced Race Guide (with the exception of the duergar getting the same thing as orcs). We included that to maintain maximum compatibility with Paizo. I do not feel that lowering our review for design choices by Paizo are fair to us, especially when our work is being compared so heavily against other 3pp material, that may or may not have chosen to maintain a similar level of compatibility. I get that you are feeling unfairly treated by this review and for that, I'm sorry. To clarify some points: Generally, I'm rather in favor of the product, hence also my review of 3.5 stars. The comparisons with other 3pp-books are generally favorable ones that put the favored class options in a rather good light and position as innovative and cool. I made abundantly clear that I don't like Favored Class Options that much and that this pdf is actually a step in the right direction for the whole type of crunch, much like other nice publications have done for traits. The books I compare this pdf to have been praised for their innovation. That out of the way, yes, this product is compatible with the ARG. Unfortunately, much like a bunch of content from UM (which I'd rate 1.5 stars, at best) and UE (1 star, what a waste of money), I consider several options in the ARG unbalanced. In fact, the ARG will not see use in my home-game as written. Maintaining compatibility with rules that are ambiguous is not something I'd consider desirable, the oracle-example prime among them. If you chose to retain design-choices by Paizo that are ambiguous or unbalanced, your content will also become ambiguous or unbalanced. Were I to review the Paizo-books, I'd complain loudly about the very same things and quite probably much more vitriolic, since they DO create the groundworks. Which becomes increasingly problematic with the slips in quality that have plagued the hardcovers since the APG. That being said, the product lost 1.5 stars. 1 star for the aforementioned rules-decisions (and the repetitions -to each race its own would have made the product better) and minor ambiguities and 0.5 for the sparse and minor glitches. That's still an above-average verdict and in my opinion, fair. I debated long and hard about this rating, but in the end, I couldn't bring myself to rate this one higher. Again, I'm sorry, you feel unfairly treated, but I stand by my verdict. Cheers and all the best! Fair enough. Again, thank you for the review. You should write a review of the ARG. I haven't seen many comments negative towards the balance there, so it'd be interesting. Well, I'll contemplate doing just that. Problem being that right now I have a lot on my hands with 3pps. Perhaps I'll manage to jam in a review of the ARG, but crunch-heavy books tend to take me quite some time. I just noticed that Shadowsfall: Favored Class Options received a pair of Four-Star reviews. Thank you to the reviewers. "However, on a personal preference, I would have loved the links to be indicated in some way, perhaps by underlining them - I've clicked on some of the hyperlinked words by accident and got the "connection to web"-prompt." I wanted to mention that we (d20pfsrd.com) have offered the option to more visually indicate linking within the app used to link PDFs to the site. It will require a tiny bit of coding on our side but it can be done. This is one of those things where we honestly weren't sure which would be more preferable. A clearly indicated link that might alter the appearance of the source text slightly, or no change whatsoever to the text yet still linking. I don't want to side-track this product discussion though so if people want to voice an opinion feel free to start a new thread and if enough people want it that way we can go ahead and at least implement the code option then leave it up to individual 3pp if they want "visually obvious links" or "no visual change to links" type of option in the linkifier application. We posted a preview for the Shadowsfall: Favored Class Options at JonBrazer.com. Read it today to see what we have inside. With the upcoming I'm Not Going to PaizoCon Sale, you can grab the Shadowsfall: Favored Class Options for $1. It starts Wednesday. Add this to your cart today. Just got home from PaizoCon? The I'm Not Going to PaizoCon Sale is still going on, but ends soon. Grab Shadowsfall: Favored Class Options for $1 before it is too late. All of these favored class options were added as an appendix to the Book of Heroic Races Compendium. So even thought that book only cover 8 races, it provides favored class options for so many more, like orcs, hobgoblins, wayang, fetchlings, and more. So for the next edition, these will get rolled into backgrounds. That will be interesting.